"The Bachelorette" premiere and "The Biggest Loser" finale back to back? That's an embarrassment of riches, if I ever experienced one. 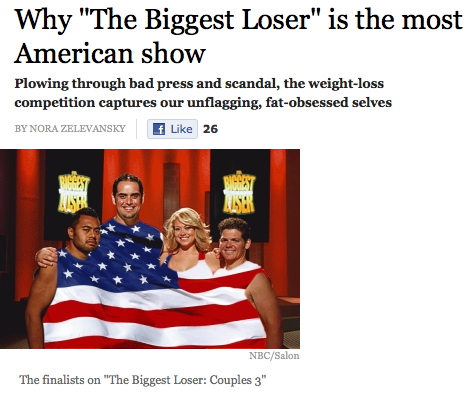 In honor of the ultimate weight loss reveal, I wrote a story for Salon.com about "The Biggest Loser," making a case for it being the world's most American show. It's also the ultimate makeover show, but that's another article. Now, in honor of that finale being over (along with every other show I watch on TV–JEEZ), YOU can read my article. Yay!